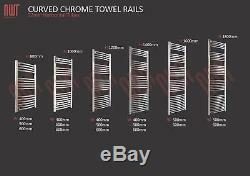 Chrome Curved Heated Bathroom Central Heating Towel Rail Rad Radiator Warmer. Electric Towel Rails (Rail + Element). Bidet Taps & Douche Kits. Shower Seats & Grab Rails. 800mm, 1000mm, 1200mm, 1400mm, 1600mm, 1800mm. Supplied with x4 Chrome Wall Brackets, Bleed Valve, Blank Plug & Wall Screws. Suitable for 3 types of Installation (See Description). Curved Chrome Bathroom Ladder Rails (16 Sizes). Heated towel rail is a functional heating solution for a variety of roomsets and installations. We have a wide range of sizes varying in width. Mm Our towel rails are ideal for both: - drying towels or clothing. Providing an efficient heat source to the room. All of our chrome ladder rails are manufactured and packaged to the highest standard. Mm horizontal tubing for improved heat outputs and aesthetics and are more appealing than the standard, smaller 19mm tube often used. The sparkling chrome outer finish is applied with over. Microns of chrome during the plating process. 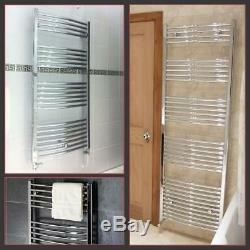 Curved Chrome Ladder Heated Towel Rails. Projection from Wall : 90mm - 110mm (Adjustable Brackets) Pipe Centres: Width of Towel Rail minus 45mm (BTUS / WATTS Listed below). 400mm(w) x 800mm(h) Curved Chrome - 1140 / 324 400mm(w) x 1000mm(h) Curved Chrome - 1422 / 417 400mm(w) x 1200mm(h) Curved Chrome - 1686 / 494 400mm(w) x 1400mm(h) Curved Chrome - 1983 / 581 500mm(w) x 800mm(h) Curved Chrome - (1402 / 411) 500mm(w) x 1000mm(h) Curved Chrome - (2015 / 591) 500mm(w) x 1200mm(h) Curved Chrome - (2084 / 611) 500mm(w) x 1400mm(h) Curved Chrome - (2362 / 692) 500mm(w) x 1600mm(h) Curved Chrome - (2761 / 809) 500mm(w) x 1800mm(h) Curved Chrome - (3010 / 882). 600mm(w) x 800mm(h) Curved Chrome - (1624 / 476) 600mm(w) x 1000mm(h) Curved Chrome - (2330 / 683) 600mm(w) x 1200mm(h) Curved Chrome - (2330 / 683) 600mm(w) x 1400mm(h) Curved Chrome - (2741 / 803) 600mm(w) x 1600mm(h) Curved Chrome - (2945 / 863) 600mm(w) x 1800mm(h) Curved Chrome - (3490 / 1022). All of our ladder rails are supplied with: - 4 Point fixing kit (below) - x1 Bleed Valve - x1 Blank Plug - Our 10 year manufacture guarantee. X3 Installation Options (Central Heating, Electric Only OR Dual Fuel). Our range of heated towel rails can be installed in 3 different ways as below. On your central heating system. You will need a suitable pair or valves. We recommend using a pair of Angled or Corner Valves When you pipework is coming from the wall or a pair of straight valves when you pipework is coming up from the floor. Please see: NWT Valve Multilisting. As a stand alone electric towel rail. You will need: - a suitable electric heating element either standard fixed temperature or manually controlled thermostatic. The towel rail to be pre-filled. Please see: NWT Electric Heating Element Multilisting. As a dual fuel towel rail. You will need: - a suitable dual fuel valve kit (includes valve kit and electric element - pipework coming from the wall) Please see: NWT Dual Fuel Valve Kits. Scottish Highlands and Islands (Postcodes: AB, DD, FK, IV, KW, PA, PH). We are more than happy to deliver internationally. The item "Chrome Curved Heated Bathroom Central Heating Towel Rail Rad Radiator Warmer" is in sale since Tuesday, January 23, 2018. This item is in the category "Home, Furniture & DIY\Heating, Cooling & Air\Radiators". The seller is "nwt-direct" and is located in Conwy. This item can be shipped to North, South, or Latin America, European Union member countries, Japan, Australia.